Beware of killer watermelons in this free but shallow casual game. 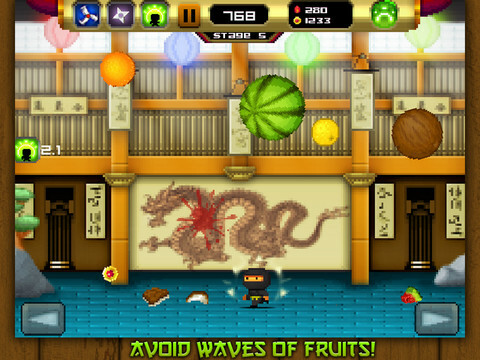 Have to admit, we expected a heck of a lot more from 8bit Ninja, the newest iOS and Android release from DogByte. Seeing the game's title filled us with visions of guiding a tiny pixel art assassin through Japan, jumping over platforms, dodging arrows and then killing evildoers with throwing stars. It would serve as a loving homage to Sega's Shinobi franchise, and quickly become one of our guiltiest of pleasures. Turns out, 8bit Ninja doesn't channel Shinobi or even Ninja Gaiden. 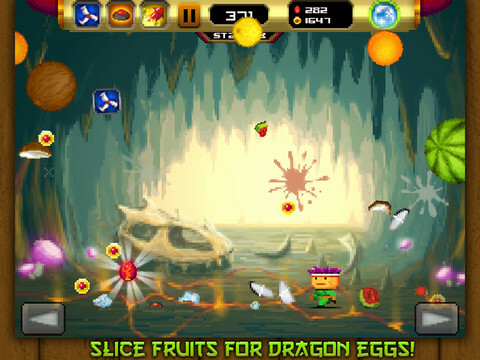 Instead, it's one of the latest mobile games involving fruit, except instead of swiping a finger about the screen slashing apples and oranges, you move the tiny ninja left or right to avoid bouncing watermelons, coconuts and lemons until one of the suckers cracks the poor guy on the head, whereupon which the game tallies your score and the whole thing starts over again. Disappointed? You bet. There's little depth to this title. What's more, this free download comes with bothersome ads. Want to know the easiest way to ruin the personality of a game? Try a Google ad for Weight Watchers. On top of that, 8bit Ninja wants money, as much and as often as possible. You receive in-game currency during play that goes towards a shield, ninja stars and other goodies, but you'll need to do a hefty amount of grinding to afford it all unless you hand over your credit card. Of course, we have no qualms spending a little dough if the game offers a compelling experience. In 8bit Ninja's case, our wallets remain closed. It's decent, the sort of free casual game that'll grab your attention for a couple minutes here and there, but quite frankly, you can find plenty of superior games that'll do an even better job at that. What's Hot: Old school pixel art graphics, free to play, enjoyable ninja music. What's Not: Gets old fast, too much level grinding, silly ads.